The second of our four new books for spring is by Miles Marshall Lewis, native of the Bronx, but currently residing in the aptly riotous city of Paris. If you want to buy Miles' book from Amazon, you can do so here. By the autumn of 1971 both John Lennon's Plastic Ono Band and Bob Dylan's John Wesley Harding were in stores. Both albums compare aesthetically with There's a Riot Goin' On; they are all musical denials of what the artists had produced before, presented at times with almost tongue-in-cheek, ironic attitudes regarding music the musicians were themselves responsible for popularizing. Soul records with this much depth had only recently begun appearing on the landscape of popular music. 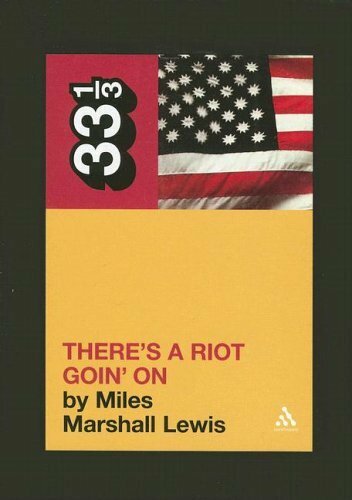 Motown released What's Going On six months before Riot. Some say Sly's title was meant to answer Marvin Gaye's rhetorical question. In fall of '71 Stevie Wonder had only recently put out his first completely self-produced album, Where I'm Coming From. Jimi Hendrix had overdosed in September 1970; he and Sly were scheduled to jam with the Experience drummer Mitch Mitchell at the Speakeasy Club in London the day before his death. (Hendrix never showed.) When the public still believed that music could save and/or change the world - with evidence to the contrary only just surfacing - Sly Stone, if anyone, was expected to bring his universal optimism and acerbic social observations to the table and help everyone make heads or tails of what was happening to the country. Be careful what you ask for. The lyrics of There's a Riot Goin' On are an interesting affair. On the one hand they show the abstruse influence of Sly's idolizing Dylan, whose work he always found inspirational. In 1986 Sly told Spin magazine writer Edward Kiersh of his plans to include Dylan on his comeback album, ultimately never completed - "I like the way he can't sing so well," he said. His desire to include Dylan on a duet proves that he considers them to be peers of the pen. Never before on a Sly and the Family Stone album were songs open to so much interpretation, and even more so, dripping with cynicism. On the other hand you can hardly hear what he's saying for most of the album. This post was very nice. I'd love to see more like it.